Whenever a cruise itinerary goes on sale, two stateroom types sell out the fastest – the cheapest and the most expensive. 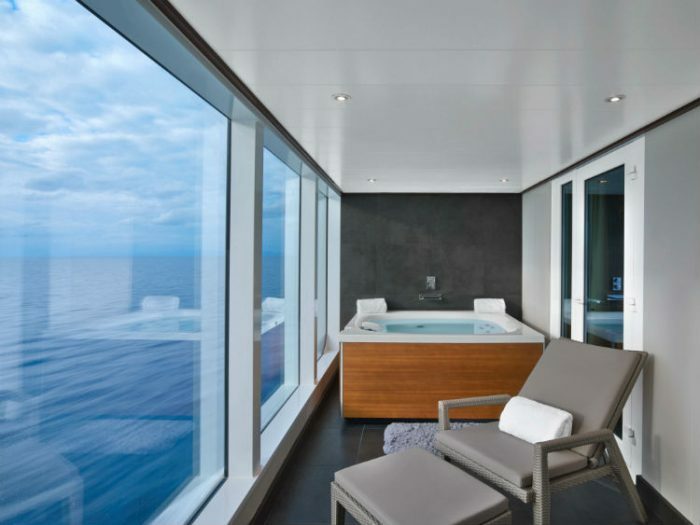 If the cost isn’t a concern and you simply want the best of the best, these are the suites to look out for when booking a luxury cruise. 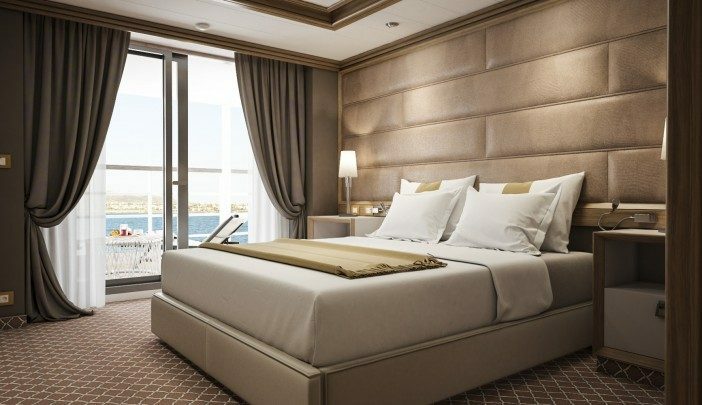 A one-off, luxury apartment, the Regent Suite can only be found on-board Regent’s Seven Seas Explorer and Seven Seas Splendor. 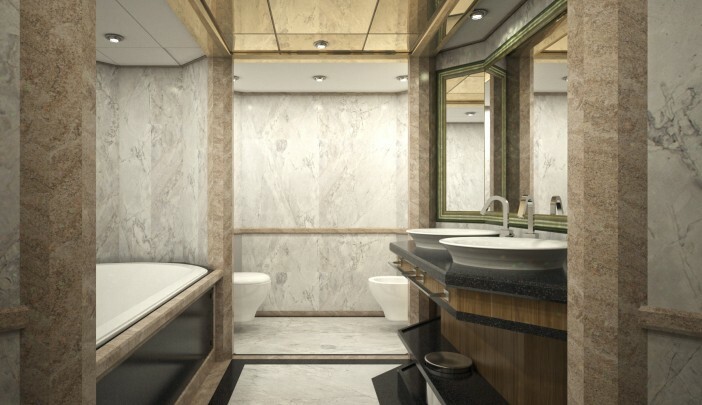 Designed to be the most luxurious suite at sea, its over three times the size of the average British home, at a whopping 2,917 square feet, with an added 958-square-foot balcony! Of course, size isn’t everything, this beautiful suite also features stunning décor of handcrafted marble and exotic wood, with limited-edition art books and Murano glass bowls to decorate. 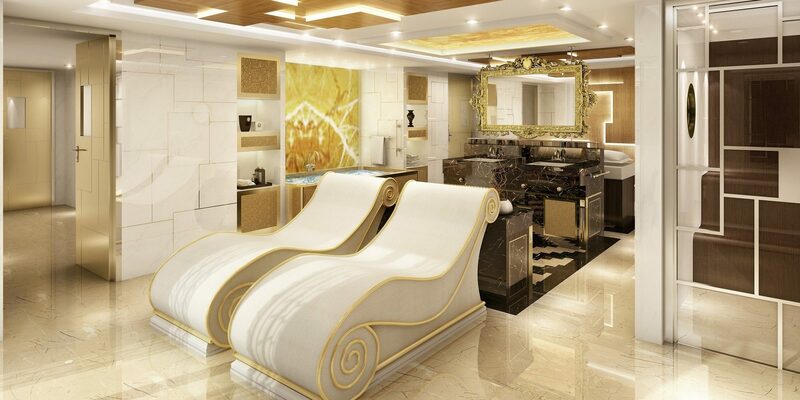 The suite also has its own private spa with unlimited complimentary treatments, as well as two huge 4K ultra-HD televisions and a Steinway Arabesque piano worth $250,000. 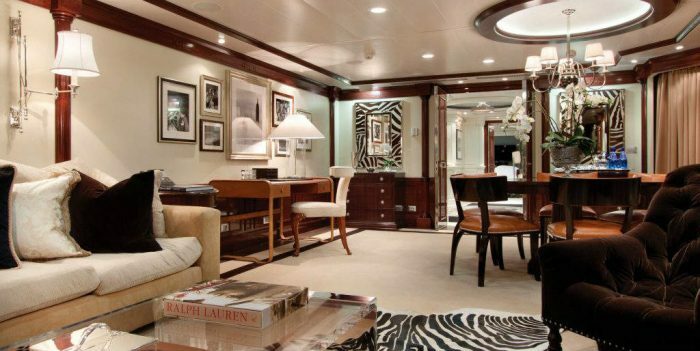 Other perks for guests staying in this suite include private transfers to and from the airport, as well as a private car and driver in every port. 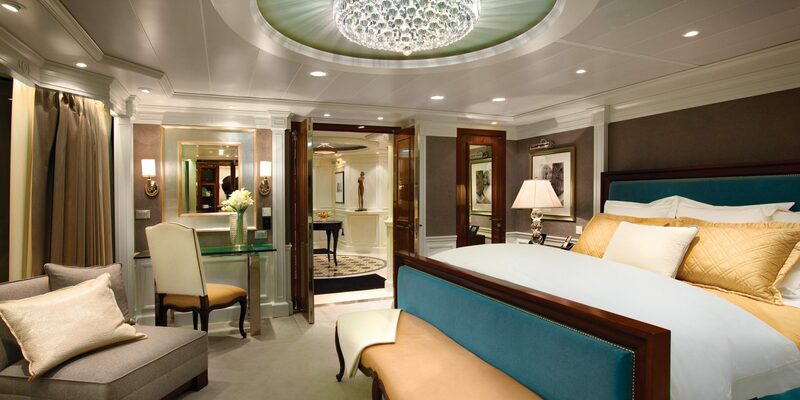 Possibly the most beautifully decorated suites at sea, the Crystal Penthouse can be found on board two of Crystal Cruises’ ships – Crystal Serenity and Crystal Symphony. 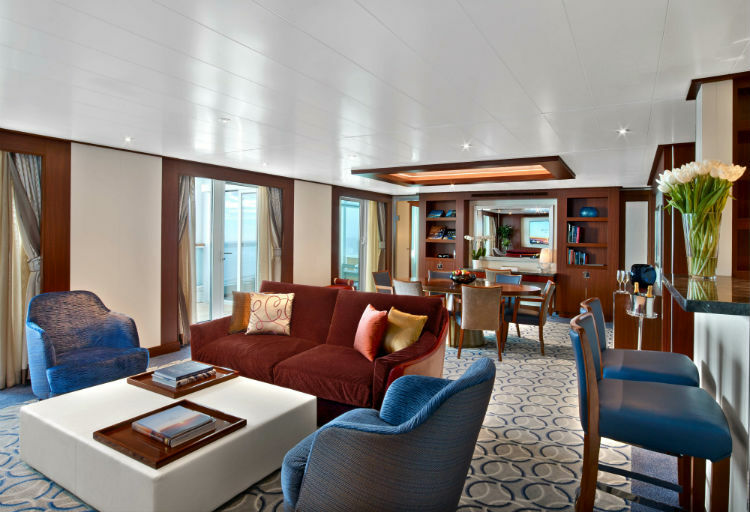 This suite features a spacious living room, with Crystal Symphony’s including a Swarovski chandelier, the dining area has a view of the ocean and there is a 24-hour butler as well as Crystal Adventures excursion reservations. 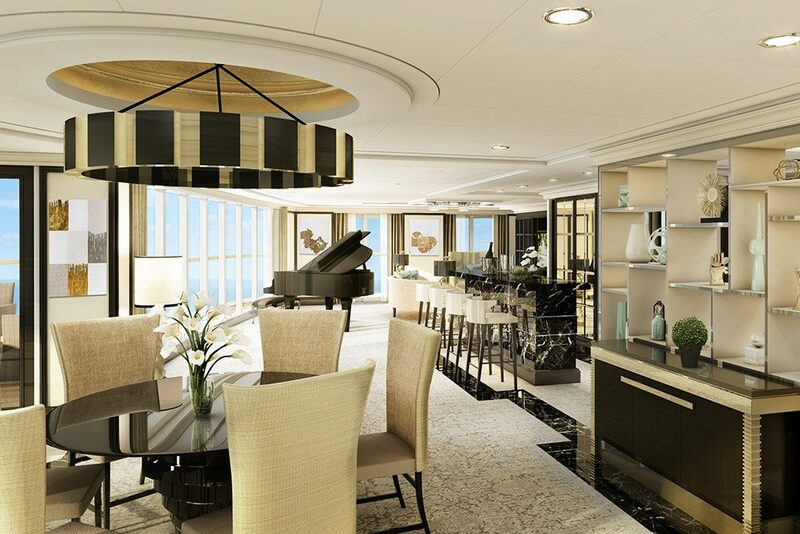 Crystal Serenity’s Penthouse suite offers a custom stone foyer floor, guest bathroom, butler’s pantry and master walk-in closet with illuminated rods. 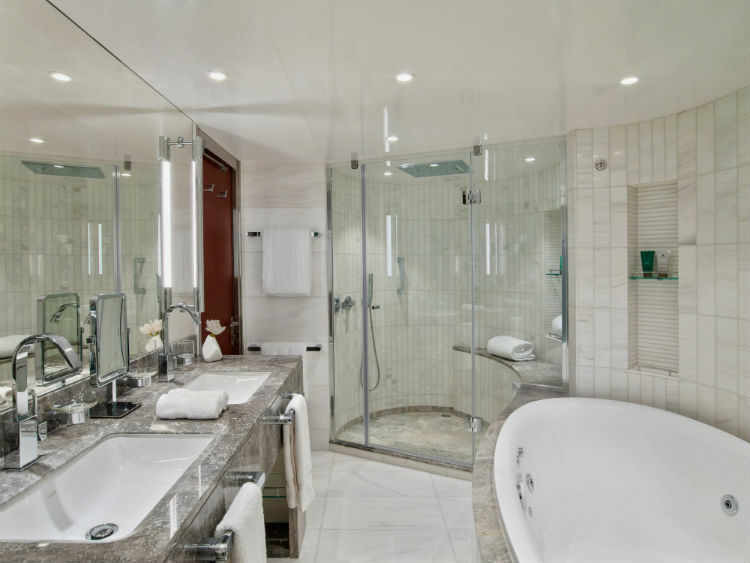 The master bathroom features a heated floor, bidet, Duravit spa flotation tub and television. Crystal Symphony’s Penthouse suite offers a separate study, custom built-in bar, Queen-sized bed with Frette linens as well as his and her walk-in wardrobes. 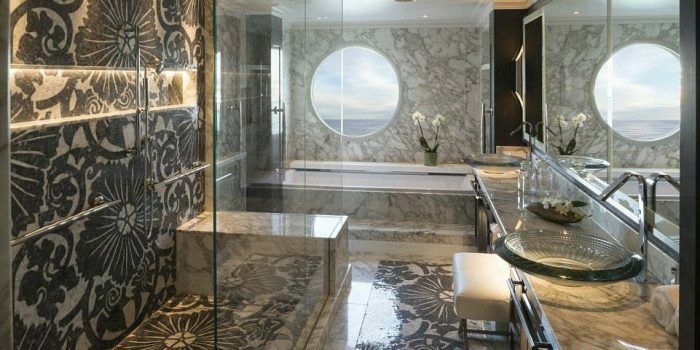 The master bathroom offers a Jacuzzi with an ocean view, crystal sconces and Calacutta marble floors. Oceania’s cruise ships each feature Owner’s Suites, spacious and well-appointed they are often some of the first accommodations to be booked on an Oceania cruise. 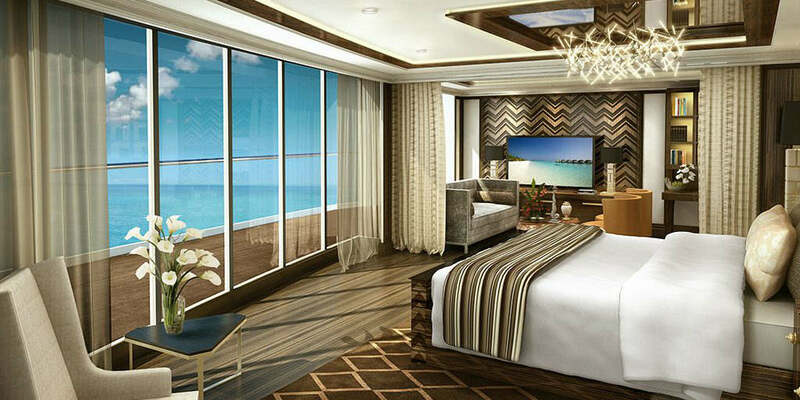 Just a few of the inclusions for this suite include 11am priority embarkation, exclusive access to selected lounges,24-hour butler service, complimentary in-suite bar setup – including six full-size bottles of premium spirits and wines. Owner Suite guests can also enjoy unlimited access to the Canyon Ranch Spa Terrace and will receive a Bulgari gift set and variety of amenities. Boasting large living spaces, king-size bed, walk-in closets and whirlpool spas, these rooms are unbelievably decadent, complete with rich furnishings from the Ralph Lauren Home Collection. 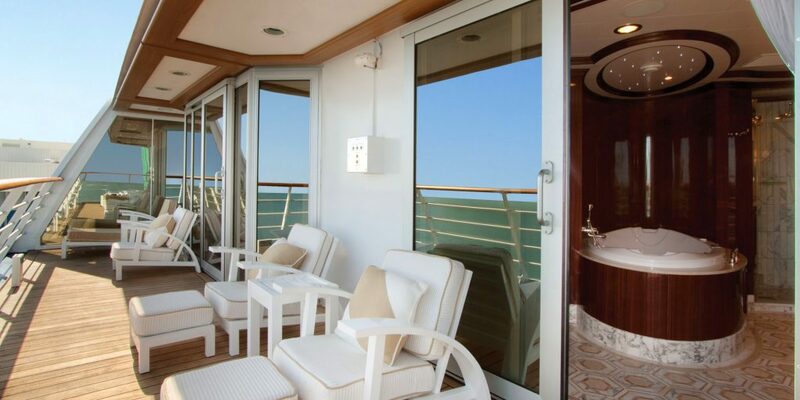 When it comes to accommodation, Seabourn only offer suites. But that doesn’t mean that all suites are created equally. 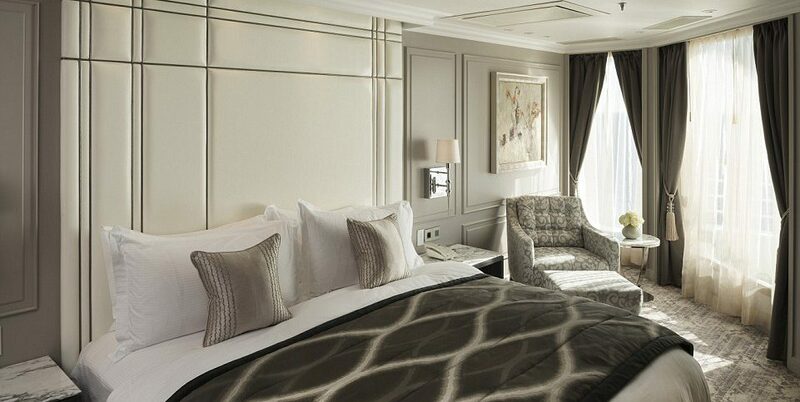 The Wintergarden Suites, which are available on each of Seabourn’s ships, are the most luxurious. With glass-enclosed solariums and day-beds, dining for six and spectacular ocean views, they are a premium level of luxury to be enjoyed. 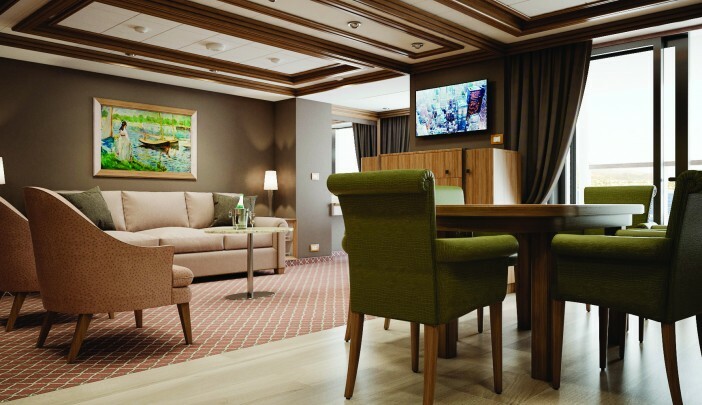 During your stay in this suite, your personal suite stewardess ensures you have everything you need and your in-suite bar is stocked to your personal preference. Guests of the Wintergarden Suites receive a whole host of extras including a bridge visit, fresh flowers, potpourri, fruit and Molten Brown pampering products. Silversea’s Owner’s Suite is a stylish apartment featuring an exceptional level of space, comfort and service. Enjoy breakfast on your private veranda, watch the sunset from your spacious living room, enjoy a bath in the Italian marbled bathroom. 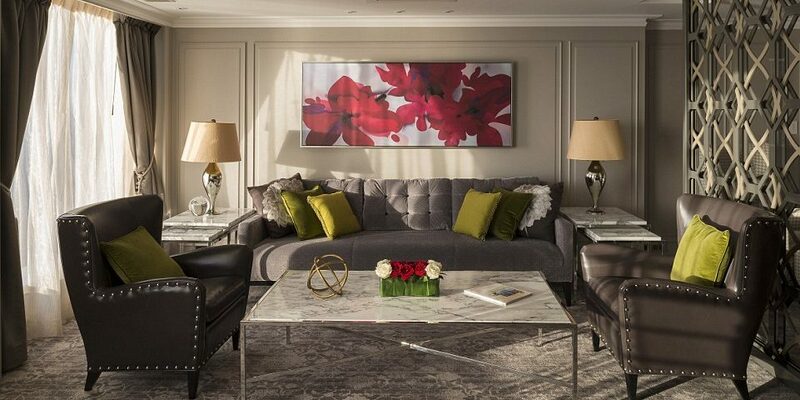 With sumptuous furnishings and modern amenities, the Owner’s Suite offers an unprecedented level of relaxation. Inclusions feature four large HD televisions, Bang & Olufsen audio system, a walk-in Italian rain shower, and deep bath, Bulgari toiletries, Plush Etro bathrobes and slippers and Pratesi bed linen with a pillow menu. 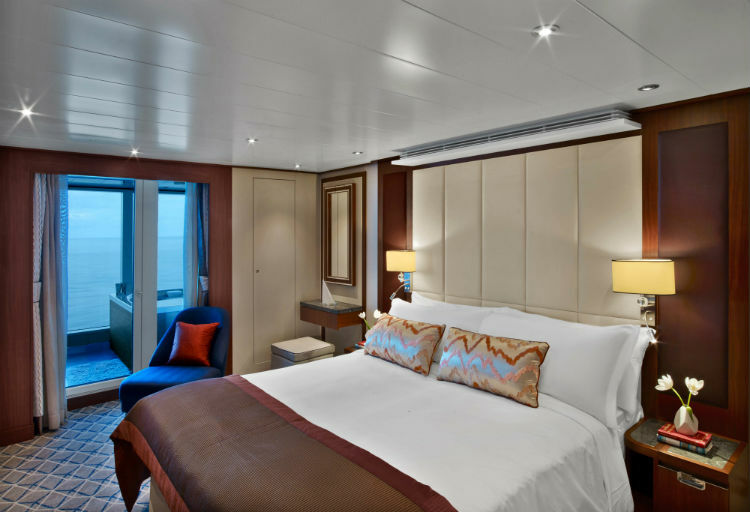 The suite can be found on Silver Muse, Silver Spirit, Silver Cloud, Silver Whisper, Silver Wind, Silver Explorer and Silver Shadow. 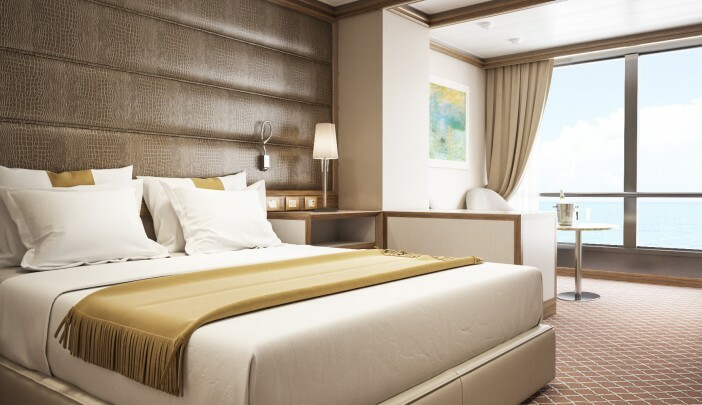 If you’d like help in choosing the best suite for your next cruise, our dedicated Cruise Concierge team will be happy to advise you of your options. 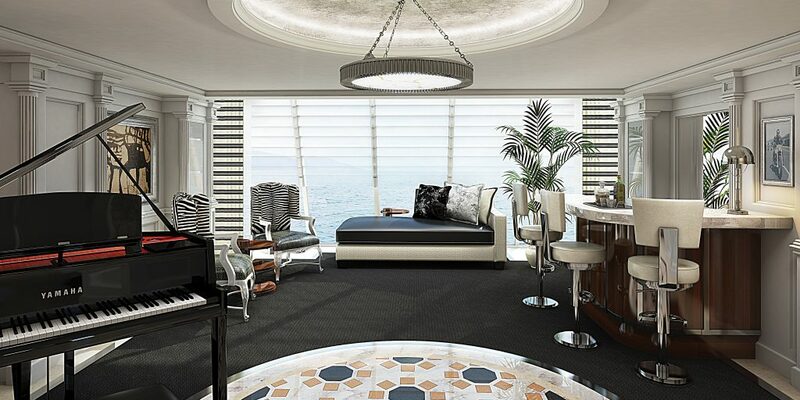 Remember, the top suites sell out first, so be sure to enquire as far in advance as you can to avoid disappointment. You can give the team a call on 0808 202 6105. Hi Wayne, Thank you for your comment. 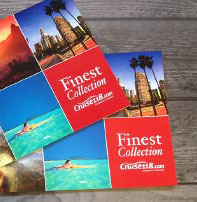 I have passed your details on to our Cruise Concierge team for them to get in touch with further details. Thanks, Emma. 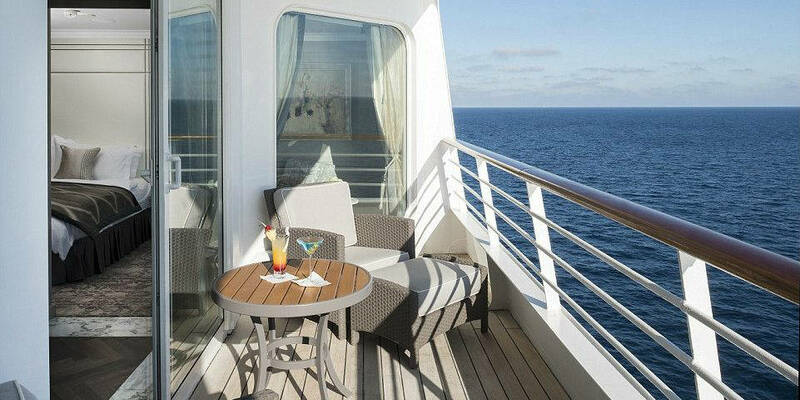 Hello Deborah, I have passed your details on to our Cruise Concierge team who will be in touch with further details. Thanks, Emma.